Forklift-Simulator - The reference in virtual reality forklift simulation. 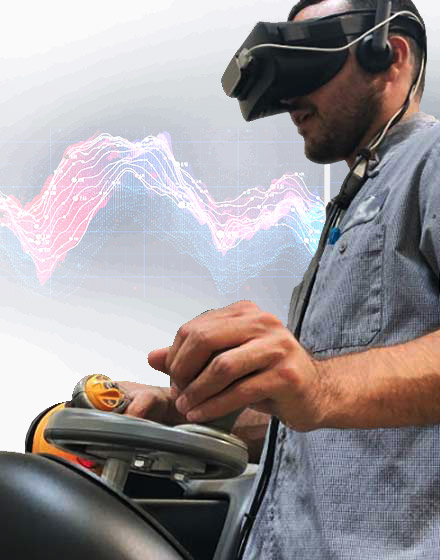 See it in action and learn how VR Forklift Simulation will improve your operation. We offer a full range of simulators to reflect the most popular forklifts. 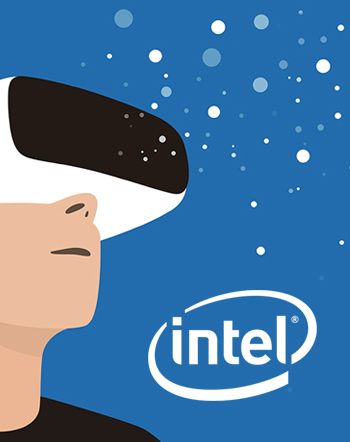 Our proprietary VR software has best-in-class graphics and detailed environments to provide the most realistic experience possible today. The Learning Management System allows you to manage your users, content, and prove your ROI with detailed test scores and metrics. The use of simulators as a training tool is well known. Virtual Reality adds an extra dimension to simulator training, immersing the user in a realistic and challenging environment. No training liabilities or damage to worry about. New operators can make their first mistakes in simulation, and seasoned operators can get refreshed on best practices with zero risk. Our state-of-the art Virtual Reality technology makes the experience extremely real. The VR forklift drives like real one. Physics are modeled with great attention to detail. Operators leverage the depth perspective provided by VR to exercise their skills just like on a real truck. Your students or operators will love it! Plug and play. Ideal for your new training room! Trucks no longer have to be taken from production for training. Maintain warehouse productivity while training goes on in parallel without sacrificing warehouse space or vehicles. Learning Management System with access for trainers to get the best out of their students. Increased safety awareness. Reduced damage. Improved hiring efficacy. Students learn and can quickly find a job as an operator. A great trainer tool! Easy ROI calculation: avoid one incident through effective training and your simulator investment is quickly returned. Additionally: cost savings in screening, hiring, retention, and training. Customers that fully realize the potential of VR simulation model their facility in simulation. This allows for training on specific working conditions, danger zones, truck attachments, and workflows. Multiple scenarios and use cases can easily be modeled. THE EASIEST, SAFEST AND MOST EFFECTIVE WAY TO SCREEN, TRAIN AND PROTECT YOUR OPERATORS. 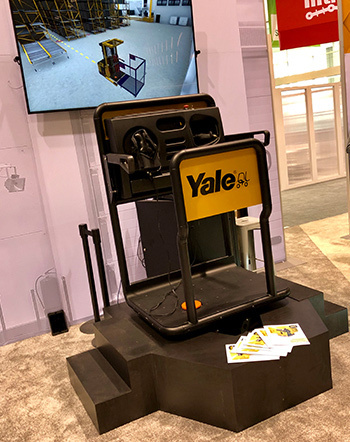 Using the VR Forklift-Simulator increased our success rate of placing a "qualified" operator from 50 up to 98%. "We were among the first to use the VR simulator two years ago. The team listened to our input and continues to improve the product. The simulators are the highlight of our logistics program." "It is an amazing tool for teachers. The students love it and are more engaged." "We opted to re-create our warehouse and double-fork attachments to improve screening"
"I developed specific programs for warehouse pedestrians and operators who had an incident to work on safety awareness"We developed specific programs using simulation to educate warehouse pedestrians on dangers in the environment, and for operators that have had an incident to rebuild confidence and improve safety awareness." "I had students finding a job within weeks thanks to the simulator. It should become a statewide standard." "We stopped training on actual forklifts. The simulators are a more practical way to onboard incoming classes of new recruits." "We use our simulators to screen candidates and quickly train sit-down operators on how to operate a stand-up truck." "Our incident rate with new associates dropped significantly since we started our new safety program with simulation."